When it comes to the sallet helmet, some of the best came out of Germany. There, the sallet became an almost universal helm, one that was worn by most warriors. This Steel German Sallet reflects the style of one such historic piece of armor. Handsome and wholly protective, this helmet demonstrates the protective power of the sallet, which offers full head protection, while leaving the chin and mouth open, eliminating the need for greater ventilation (traditionally, a warrior looking to protect their lower face would have worn a bevor with their sallet). This helmet is made entirely from mild steel, and is offered in two different gauges, to suit the wearers need. 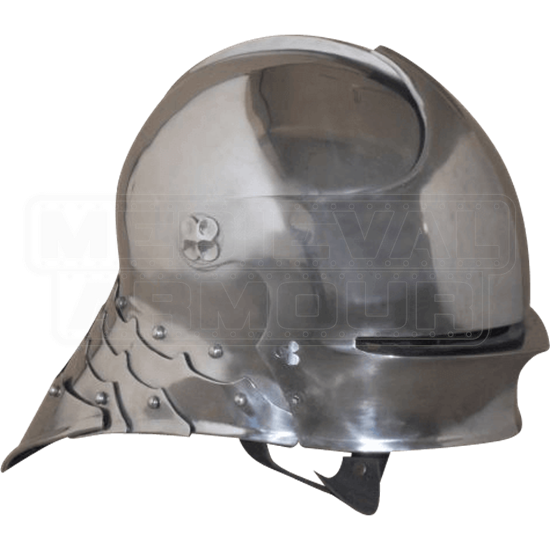 Like a classic sallet, the helmet possesses a rotating visor with a thin, wide eye-slit, for better vision with the visor down, while the back possesses an articulated cascade of plating to offer superior defense to the back of the head and neck. The interior of the helmet features an inner liner, as well, for added comfort for the wearer. 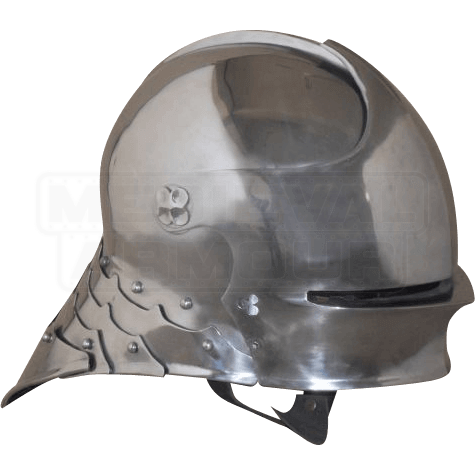 The 18 gauge version of this helmet is perfectly suited for costume use and LARPing, as well as light reenactment, while the 16 gauge version is heavier and more suited for SCA and traditional combat reenactment. Distinctive in its look, this Steel German Sallet helmet brings a touch of unique appeal to any armored warriors look, and more than that, it also confers an impressive level of protection onto its wearer, as well, and both of those are very good things, indeed.